From Goodreads ~ Did you ever wonder what it would be like to have hockey legend Gordie Howe as your dad? If you're like thousands of Canadians who grew up in the 1960s and '70s, you need look no further than Mark Howe's funny, intimate account of being a Howe. As a boy, Mark played ball hockey with the kids of other Detroit Red Wings on the stairs of the Olympia, and his mom, Colleen, created a place where the neighbourhood children could play hockey in the winter, even to the detriment of her own windows. At age sixteen, Mark was the youngest player ever to win an Olympic hockey medal. At eighteen, he joined his legendary father and his older brother, Marty, to become the first father-and-son teammates in hockey history, playing with the Houston Aeros of the WHA. Howe carried the Philadelphia Flyers to two Stanley Cup finals and completed a twenty-two-year professional career with the Detroit Red Wings, with whom Gordie played for twenty-five seasons. When Mark was inducted into the Hockey Hall of Fame in 2011, he honoured his father by proudly wearing Gordie's retired number 9 Red Wings jersey at the ceremony. "Gordie Howe's Son" features many touching, sometimes harrowing stories - Gordie caring for his wife, Colleen, as she became debilitated by Pick's disease, and a freak accident that almost killed Mark while playing for the Hartford Whalers. Featuring many never-before-published photographs of the Howes, this is a book about hockey's royal family told through the career of its Hall of Fame son. Gordie Howe was Gord's favourite hockey player (they share a name and a birthday!). Howe passed away last week (on June 10) at the age of 88 and that prompted me to read his Mr. Hockey: My Story, which Gord had read and recommended. 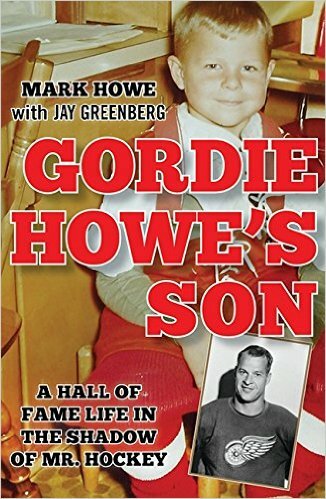 I saw that his son, Mark, had written a book about being Howe's son so I thought it would be interesting to get his perspective. Mark was an American-Canadian former professional hockey left winger and later defenseman who played 16 seasons in the National Hockey League (NHL) and six seasons in the World Hockey Association (WHA). Howe was one of the best two-way NHL defensemen of the 1980s, being a three-time runner-up for the Norris Trophy and making the Stanley Cup finals three times as a player. He is a member of both the United States Hockey Hall of Fame and the Hockey Hall of Fame in to which he was inducted in 2011. He is currently the Director of Pro Scouting for the Detroit Red Wings. This book is Mark's story of growing up as Gordie Howe's son and naturally following his father into professional hockey. In fact, for many years he played with the Houston Aeros in the WHA along with his father and brother, Marty. He starts with the beginning of his playing career and details his experiences on and off the ice, with stories of games and the players he played with and against.